i’ll be the first to admit that talking about the weather is something i do a lot here. maybe too much. but when you live in northern new york, it’s hard not to. this morning my husband’s phone announced that it was -34°. that’s no typo. negative thirty-four degrees. we have snow up to our hips every square inch of the outdoors except for the plowed parts. the snow banks are taller than the car. as a girl who grew up in houston, texas, and built a 6-inch snowman one lucky winter, this weather is like observing a freakish phenomenon. and frankly, i’m over it. i realized something important about myself. i need to be able to be outside, breathing fresh air that my lungs don’t reject for fear of frozen alveoli. i need to feel warm sun on my skin, without legitimately worrying about frostbite setting in. toes in the grass… heck, just the site of grass. my friends here and i have taken to texting each other pictures of green grass, just so we don’t forget what it looks like. but honestly, enough complaining. i’ll stop. or at least try really hard to. 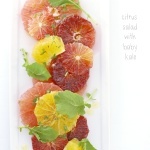 instead, this week, i found a bright and flavorful burst of sunshine in this citrus salad. 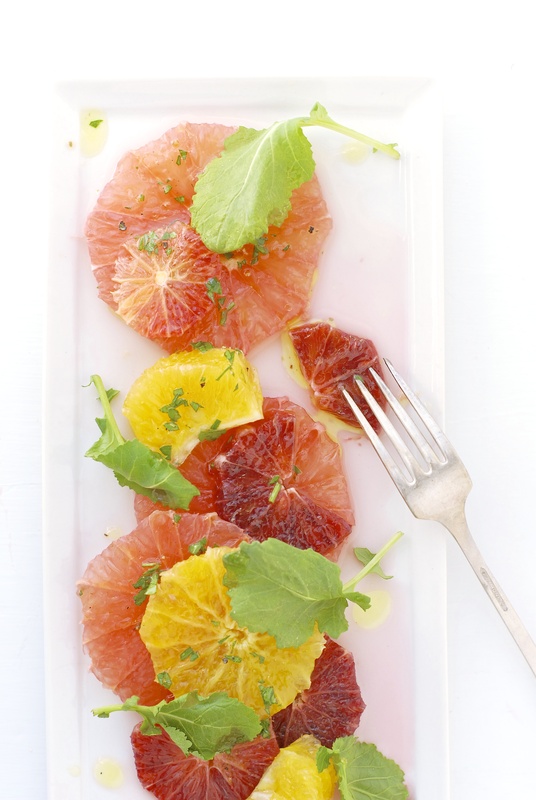 because citrus is so timely and ready during the winter months, it brings a much needed dose of vitamin C, beauty and hope. if you’re one of the lucky ones sitting outside for lunch these days, i suppose you too can enjoy this one. but if you’re like me, bundle into your sweater just a little tighter, take a deep breath, and savor this pretty plate of sunshine. spring will come. 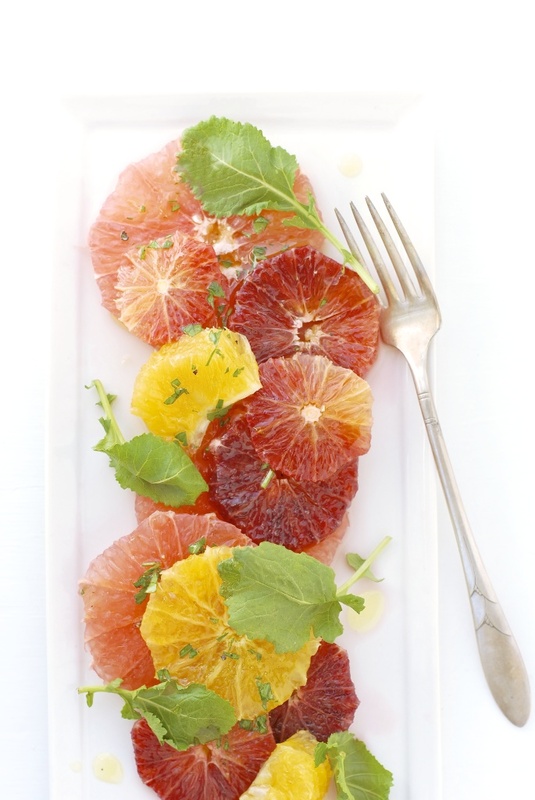 Combine first 6 ingredients in a small bowl; stir with a small whisk or a fork until well combined. 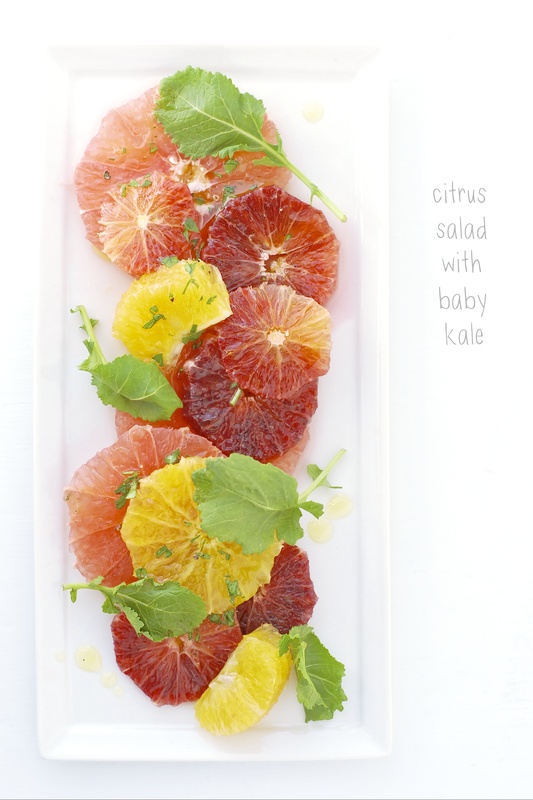 Place citrus slices and baby kale on a serving plate. Drizzle evenly with dressing.